Hayes is going strong with his love for Pokemon! To put it nicely, it’s not my favorite thing. So this theme was a stretch but thanks to Zurchers Party Store I was able to find so many great options to make it a little bit more minimal and graphically pleasing. It was a beautiful day so we did Pokemon Training outside. It was basically teams and relay races. We did one legged races like Spoink, crab walks like Kraby, Running sumo squats like Jigglypuff and they learned to trap their Pokemon by running with a balloon and then sitting on it to pop. 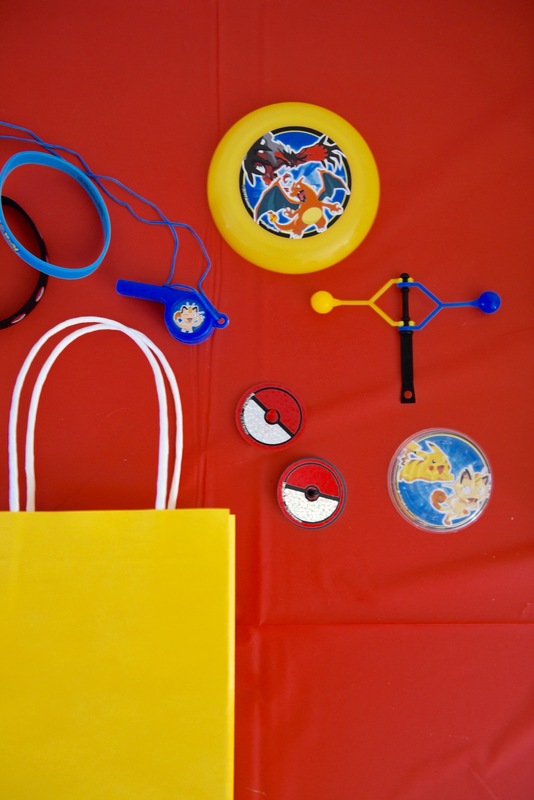 We got creative, and as I said, I don’t know much about Pokemon so I got a lot of looks from these kids. They were onto my ignorance. 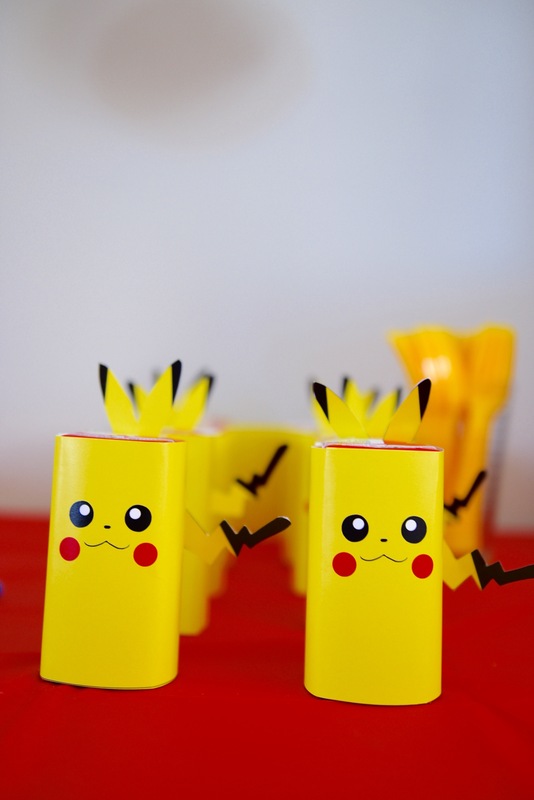 So after the relays we had them come in for pizza and Pika-Juice. 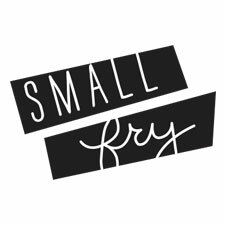 This free printable kills me and you can find it here. After eating we had them make their own favor bags. I have found that I can never fully plan for favor bags. I either have way too much or not enough and it stresses me out! So this year I had enough of these favor kits from Zurchers on hand to ensure every kid got plenty, but then once everyone arrived I did quick math and figured out just how many items they could pick. Then they walked the table and picked their very favorite 5 items! I had enough of these paper bags as well but they were in colors and prints that I like every day so I can reuse the extras! Red, red stripe, yellow. 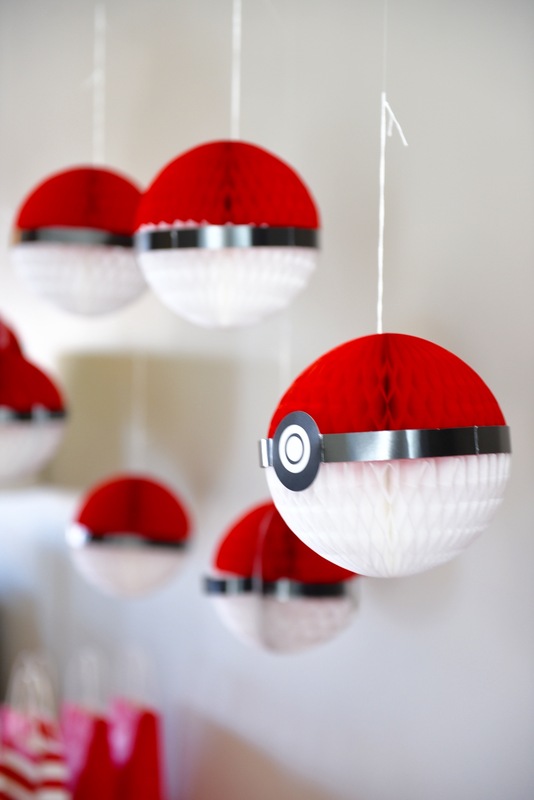 I loved the look of these Pokeball honeycomb decor! We just strung them to the ceiling and alternated lengths and depths. Super easy! 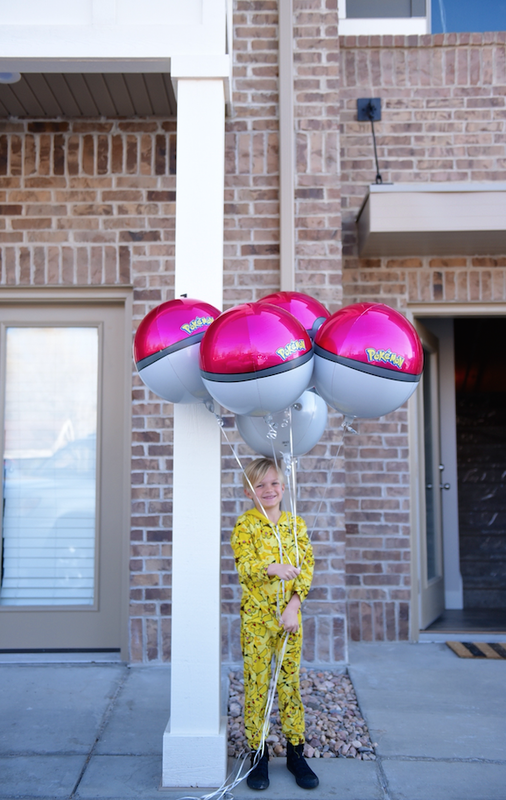 They also have great Mylar Pokeballs and Pikachu, which we used to show the guests where to come and now are constant sources of entertainment for baby Raleigh! Oh, kids and their odd choices! 🙂 But this sure looks great, you pulled it off nicely and your Hayes looks very happy. Thanks for sharing!